Heart-to-Heart Mentoring was designed with communities in mind. There are 3 books available to help jump start the community, the Heart-to-Heart Mentoring Guide, Workbook and Training Manual. In the Mentoring Guide, the high school students will see firsthand how each week could be planned with an entire lesson plan, suggestions and conversation starters. A debriefing section at the end of each lesson allows for the mentors to discuss the session and come up with solutions or opportunities for the next lesson. Topics include: Introduction to the program, respect, body language and perception, team building, peer pressure, media messages, relationships with boys, responsible decisions on tobacco and bullying. To wrap up the program, a celebration party is included as a reward for the mentees for graduating the program. The Mentoring Guide also has extra lesson plans, activities and discussion in order to suit your specific group of Elementary School girls. 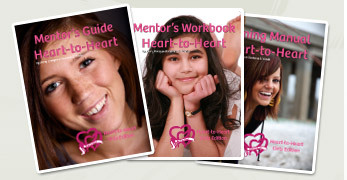 The Workbook was created specifically for the 2 day Heart-to-Heart mentoring course. he two day course is designed to ensure that each high school participant understands what it means to be a mentor and how to use the H-to-H program to fulfill the mentoring role. Inside of the workbook, the mentors will find the necessary background information, worksheets and course information that they will follow along with during the training course. There is ample note-taking space included in these pages to ensure that everything learned through group discussions, role-plays and activities can be recorded in this workbook. Upon completion of this course, the mentors keep this workbook as a reference, and it can assist with preparation for the day to day lesson plans H-to-H has. The Training Manual is essential for adult faciliators planning to deliver the Heart-to-Heart Mentoring Program in their community. The Manual has the activity breakdown for the two-day Mentoring course, descriptive outlines for the activities and group discussions as well as a time line for the course. It also includes information on how to get the program running the community, what resources are required as well as suggestions for funding. The best part: Adult facilitators or trained Heart-to-Heart Mentors are able to use this Manual to host their own training course in the community to train new mentors. "H-to-H" is fun, positive, effective, and powerful, and results in plenty of heart-to-heart discussions.